So while the crown molding gets to know our house a little better (and I dreamily gaze at it while whispering sweet nothings) we’re excited to share our 2013 Benjamin Moore paint picks! We’re a little tardy for the party with this – and a big thanks to everyone who has been asking about it! – but we just didn’t want to pull them out of a hat. So we took our sweet time finding the colors we wanted to marry. All 32 of them. It’s going to be the wedding of the century, guys. And here’s another one (you’ll find four more peppered throughout the post). We’ve been using Benjamin Moore colors for around half a decade, and we’ve been buying their actual paint since 2011 (we first tried it out on our office built-ins), so when they invited us to curate a collection of our favorite colors last year, it was pretty much a dream of ours. And jumping back in to choose 32 new colors for 2013 was just as much fun. This partnership is just like any other side gig that helps pay the bills – like writing a magazine column or our book – except we get to play with paint chips for this one, so… yeah buddy. Our process was pretty simple. If by simple you mean splaying out 561 paint swatches (you think I’m kidding) in order to choose our favorite 32 colors. It was beautiful chaos, I tell ya. And I loved every undertone-investigating minute of it. The goal is simple too. We just hope anyone out there who’s overwhelmed by a giant wall full of swatches will find comfort in a smaller collection of favorites to peruse and potentially use in their home. And we hope that some of the suggestions spattered throughout this post get your motors running. You know, in that exciting I-want-to-paint-something-right-this-second way. Or in that I-want-to-paint-something-but-first-I-need-a-marshmallow way. Either one. And since we’re on the subject of color, have you guys used any paint colors that you’ve loved lately? Do you keep a little folder of your favorite swatches? Or a pinterest board full of ’em? How do you keep track of them all? When we were choosing this collection we discovered that cutting out swatches individually and laying them all out on a neutral background (dark charcoal colored Karl, haha!) was a great way to see how they all worked together. And it helped us “balance” things by being sure we had enough dark choices, bold ones, neutrals, and soft and serene colors that weren’t too bright or too neutral. In short: if you have a few spare weekends and a neutral colored sofa, I highly recommend playing around with paint swatches instead of watching TV. Seriously, it’s right up there with a marathon of The Walking Dead (albeit a lot less bloody). Psst- We picked a winner for this week’s giveaway, so you can find out if it’s you right here. This is awesome! Looking forward to browsing your whole collection. Can you believe they don’t give out swatches in Spain?!?! You have to buy a paint deck or choose the color at the store (definitely not ideal).! Really?! I never knew that! 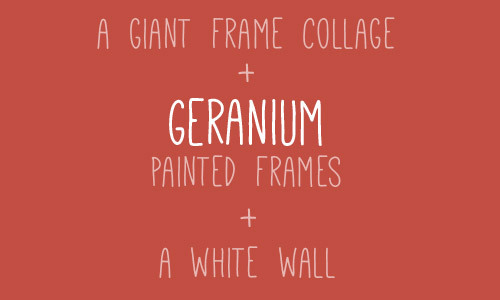 This makes me want to repaint everything in our house… Love the geranium frames. Maybe in your new hallway with the board and batten? Haha, I love it! Wishing you many more years of happiness and love with your nail gun. Ooh! Wow, whittling down 561 paint swatches to these only 32! There’s nothing that intimidates me more than picking paint. After a while, all the colors just start to look the same… Thanks for the pretty paint options! Sure thing Diane! It’s actually fun once you get into the zone. We get all squinty and serious and it’s one. Haha! Unless you’re a color pro like John and Sherry, picking paint colors can be intimidating. 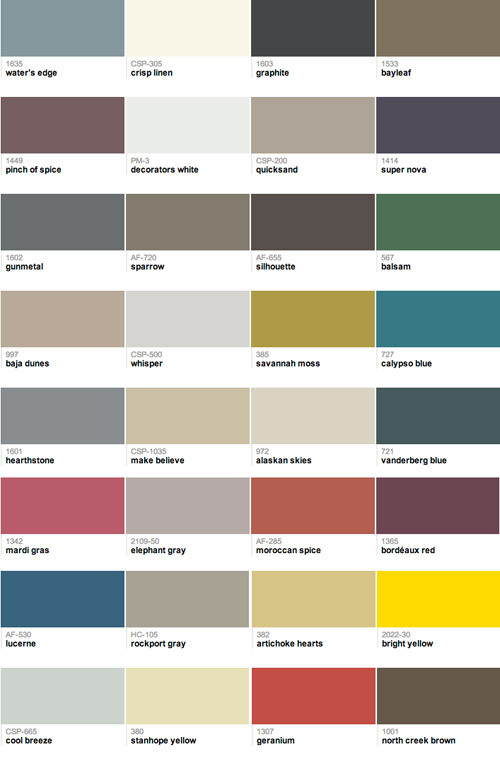 It helps to narrow down your paint choices to a select few before you find yourself facing a wall of swatches. I would like to hear their thoughts on how to avoid this ‘paint paralysis’ that haunts most of us. 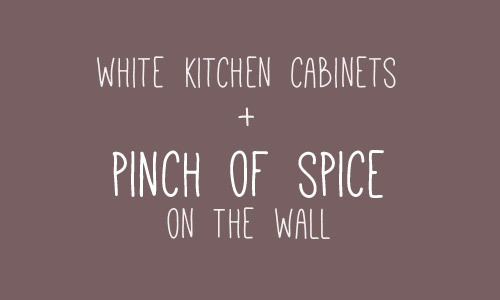 So can we expect to see Pinch of Spice on your walls in the near future since you’re toying with the idea of potentially repainting?!? What a fun gig! I can just imagine spreading them all out on the floor and picking the ones you love! Fun! I’m loving the Moroccan Spice! It would look awesome in my dream kitchen: all white with pops of a tomato-y, spicy red and Jadeite green (since I collect Jadeite)! We actually used that for an entire wall of our playroom back for the book (and then painted it back so no one saw it before the book came out). It’s a gorgeous color! Perfect timing! I’m brainstorming about what colors to paint our new apartment (but shh – don’t tell my husband because he does not like to paint!). Haha, your secret’s safe with me! I agree! I wish they’d come to Home Depot and Lowe’s someday just so more people can get their mitts on their paint! In my area, certain Ace Hardware stores carry Benjamin Moore – including the Aura line. The Ace guys are very knowledgeable, but the folks at my local BM store just rock with advice and how-to tips. Got me through my master bath wallpaper removal and paint job. So true! They totally know their stuff! We used Behr colors on our walls (just posted a room reveal today!) and many of our color choices were inspired by you guys. I used light gray as our backdrop/neutral and some people thought I was crazy to use a “cool color.” But ya know what… now they’re changing their tune! 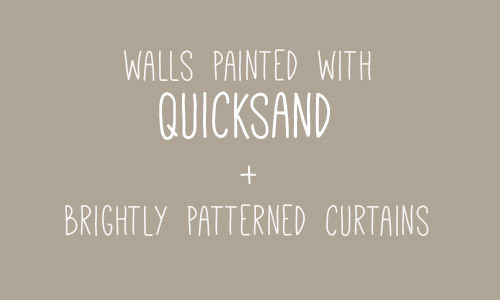 Cannot wait until the day I can paint walls. cannot. wait. Love these! Especially that Calypso Blue…I see a test pot of that in my future. It’d be great to paint some frames for an accent color in our living room. Thinking about your bedroom color made me go with a darker gray in our new master bedroom. It’s Pavestone by SW, a darkish gray with brown undertones, and I lurve it. So comfy and cozy feeling! We used that for a wall in the book and loved it so much in person! Great color picks! I love Benjamin Moore, really quality paint. We painted our whole first home with it. There isn’t any close to us at the moment unfortunately. I spy with my little eye…a new teal cart in the dining room! I’m loving your new collection of paint colors. They have me itching to paint something! Woot woot! It’s so cute in there. I owe you guys pics (and a whole house video too!). Our nursery is actually painted something very close to pinch of spice (little more purple maybe? ), with black and white, and bright yellow accents. Love it. Hilarious about your nail gun! Haha! He lives the life of a king! We’ll be painting our dining room next weekend – a nice light gray on three walls, one chalkboard wall and an accent color in the entry and on a bump out (emerald? mulberry? peacock? jury’s out on the accent color!). Huh…now it sounds a bit crazy! I think it will come together well, though! Also I just gotta say that I like all the collections they have online… but ppsst shuushh. yours is the best! I saw the button on your sidebar last night and wondered when we’d get the scoop! Love your suggestions. We just painted our bathroom a color very similar to Calypso Blue with white board and batten. That Geranium color is fantastic…need to brainstorm a place to use it! Thanks for the inspiration! Your bathroom sounds so pretty! And definitely send us photos with Geranium in action if you use it. In person it’s so pretty and rich looking! Love the color choices! Hubby and I bought our first house in June and we have been painting rooms right and left. It has definitely made the house feel like “ours.” Out of all the colors we’ve used, I’m most in love with our living room, which is painted Cedar Green by Benjamin Moore. To me, the name kind of sounds like a forest green sort of color, but it’s really more of a vibrant spring-like green. It’s just gorgeous and makes me feel happy and peaceful whenever I walk in that room. We haven’t done much accessorizing yet, but I’m feeling some goldenrod yellow and magenta! That sounds so pretty! Would love to see pics! Sounds so pretty! It’s such a rich color. Love it! How did you know I am picking nursery colors this weekend! Do you have any gender neutral baby’s room color suggestions? Congrats for the bean on the way! Wahoo! I love Stanhope Yellow and Cool Breeze for a soft gender neutral nursery. And if you’re going for bold, Balsam would look amazing for a girl or a boy’s room! I always in theory *love* a bold color on the walls and then when I actually try it I immediately reel since I feel too boxed in haha. I do love the idea of having pops of colors in accessories throughout. I like to take all the brighter paint colors I like and use them to help decide what accent colors in accessories I want in my room. Right now I’m leaning towards creme/navy and bright pops of green for our living room! This is random but this morning on zulily.com they have blueprints of bicycles! Holy cow those sound awesome. Great choices! I’m in the process of picking the right shade of deep emerald to paint my kitchen cabinets so I know how serious paint selection can be! What nail gun did you get? I was planning on picking one up this weekend. That’s in this post (there’s a photograph of the box and everything). Hope it helps! I debated between Lucerne and Bellbottom Blues for the back of my book case and went with the the latter! But Lucerne is a beautiful color, too! I am wondering if we are going to see pinch of spice on your kitchen walls soon??? You did mention going a little darker and moodier, did you not? 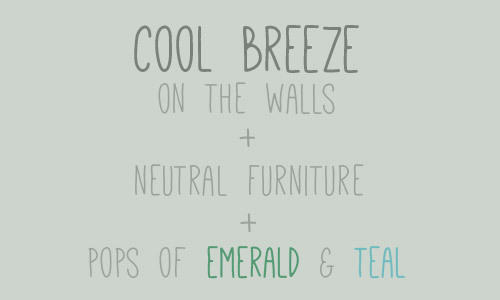 Cool breeze really does look like a nice color — might try it in my home office! Haha, it’s the good ol’ snowball effect! Benjamin Moore doesn’t pay me anything, but I will still talk all day about how completely in love with them and their fabulous paint colors I am :). I’ve been looking for a great purple for a little hallway and maybe my half bath….I’ve got my eye on Super Nova now–thanks! Haha, good luck Gretchen! Send pics! You all know I love Clara’s Alaskan Skies…err…Edgecomb Gray…Baby Fawn :) Question–is Decorator’s White a white white white? We are inspired by your Board and Batten and we are going to attempt soon but we want a true white, I think. This whole comment makes little sense in rereading it, ha. It’s definitely a nice clean white. Not too cream/yellow and not too blue/cold. Right there in the middle (it’s pure, haha!). We totally used your 2012 picks TO DEATH. Richmond Green became the wall color in our bathroom (which has almost no wall to actually paint). And I think the white we chose for the kitchen cabinets was one of your picks too, but I don’t have the color handy and I can’t find the 2012 picks online any more so I can’t check. Oh well. Anyway, thanks for narrowing it down for us again. I have a whole huge swatchbook, but it’s totally overwhelming sometimes! Aw you’re welcome Ali! So glad you got some use out of them! Love your new collection. We need to repaint a few rooms, and seeing your picks and ideas has me thinking… it’s painting time, y’all!! Hootie hoo and happy painting! Woohoo! Lucerne is the color I’ve been planning for an accent wall behind our bed in our master bedroom…something deep and mysterious and moody, with a mid-tone gray (hmmm, maybe Hearthstone?) on the other walls. I love seeing it on your list! And I’m also loving Geranium…need to find a place for that. Wahoo! Send pics for sure! We’ve been peeping a lot of paint chips lately. Nothing for home improvement but trying to nail down (ha, pun!) what sort of color pallet we want for our wedding! I loved that song! The video was freaky though. What kind of nail gun did you get? That info’s all in the post before this one (there’s even a picture of the box). Hope it helps! We had to totally redo our downstairs after Sandy hit and we painted all of our rooms with YHL colors! They look so nice and clean and fresh! We love your choices!!! Ahhhh! That’s so cool. You have us permasmiling over here. So glad they came in handy! On another note in love your picks so nice to have a smaller group to peruse. I think it is so cool that you have the Benjamin Moore partnership! What a fun thing to do…and a great service for all of us! Aw thanks Megan! We still can’t believe it! Can I ask you guys for HUGE favor? We bought our first house 10 months ago and haven’t painted a thing. Why? Because we’re scared we’ll use the wrong type of paint. We want to paint our cabinets, we want to paint a few walls and we need to touch up some of the moldings and threshold boards– the problem is that it’s an older house and 1)We don’t know what type of paint to use and/or how to match the color 2)We don’t know all the ins and outs and benefits of one type of paint over another. Do you have a resource or blog about the different types of paints and what to use for which projects and which ones to avoid? Oh yes, here’s a post all about finishes and here’s one full of tips for how we choose colors. And here’s one about how we actually paint a room. As for matching the color, I’d just bring home a ton of swatches that look similar and hold them up to see which one’s a match (you can also cut a piece of drywall and bring it to the store to color match it, but it’s a lot more involved). Good luck with everything! Oh, Benjamin Moore! We really wanted to use their paint in our bedroom makeover, but just couldn’t find a grey that didn’t read blue in there (it seemed to be a trick of the light, since our tests turned out blue in every other room, go figure!). We ended up going with Para Paints Rocketman with a feature wall stencil in Shapeshifter overtop. Aaand, I couldn’t make that up if I tried! The wall looks amazing, but I think I get a little extra pleasure from the Star Trek/True Blood vibes I get from the names, haha. We just spend most of our staycation painting the last three rooms in our house (only the hallway to go!) and it was completely awesome. Our bedroom is now a dark, moody, aloe-ish green with lots of blue undertones. Our office and bathroom are one of my favorite colors I’ve ever used. It’s called Cumulus Cloud by Martha Stewart and it’s a light, airy sometimes blue, sometimes gray, sometimes green that looks EXACTLY what clouds look like. Even my husband is mesmerized by its range. Lastly, our guest room was painted Tahini, which is a yellow with a little gray and a lot of buttery warmth. This is the first time I’ve lived in a house with a color I love on every wall and I can’t get enough of it! Wow, that sounds gorgeous- and so satisfying to get all those rooms done! 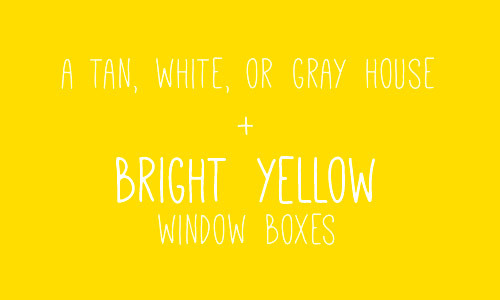 Now I’m wavering on my choice to paint my front door bright yellow. Those teals are just so gorgeous. Yellow or teal door on my reddish brick house. Such a major decision! I’ve seen them both look awesome! Probably can’t lose either way! 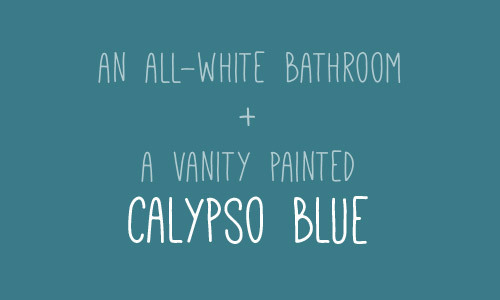 Oooh- I love the Calypso Blue- and the idea of doing an all white bathroom with a Calypso Blue vanity! We’re about to repaint our bathroom- I’m tempted to try this! I also love the idea of the Geranium Frame collage- especially with high contrast black and white photos/posters. I have a stack of black metal frames- I might have to find a similar color spray paint and try it out! Ooh send pics if you do! When picking colors for our house I pulled dozens and dozens of blues, greens, tan and white…poured over them for hours, matched them with fabrics…analyzed and agonized. I whittled them down to 5 favs of each color layed them out for my husband to look at when he got home from work for a final approval. He looked them over for 30 seconds and said…this blue, this green, that tan and that white. Ha! Gotta love men! 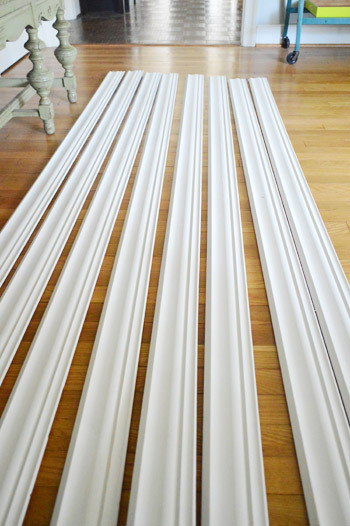 What size crown moulding did you buy? From where? Im excited to see the install since we failed our first attempt. Haha, I love that about the paint picking and men. John was much more decisive than I was with this collection too! As for the molding, we’ll share all those details in the post on Monday! Love the color selections. We recently used Rockport Gray in our main bathroom and it looks amazing with our tub to ceiling bright white subway tiles in the bath area. Quick question–when you say "acclimate" the crown moulding, what does that mean? I noticed you said that about the wood for the batten, too, which is something I might need to know 'cause I'm gonna attempt my own mudroom redo this weekend!! Thanks for your oh-so-marvelous blog. It basically means wood should sit in your house for about a week so it can get “acclimated” (if you install it right away before letting it sit, it might contract or expand from the temp in your house and cause cracks and stuff). So letting it sit will let all of the expanding and contracting happen and then when you hand it it’ll stay put and not try to expand/contract on your walls (resulting in cracks). Hope it helps! Oooooh!! Thanks SO much for writing back. You saved me from making a big mistake, as I was just going down to buy my wood tomorrow and begin nailing away. :/ Whoops. Behr’s Cayman Bay is my favorite color of all time. I have it in the living room as well as our coat closet. And our little hallway. Can’t get enough of it!